We help grow successful companies. Let us help you grow yours. "As a 20 year professional, career mediator with a degree in Psychology and a major in Conflict Resolution, (coupled with a prior 15 year career in banking and finance) I believe that business is truly about people working with people. Isn't that what your business is about? Doesn't your business provide a service or product that helps solve another person's problem or dilemma or improve someone's life in some way? Don't you need other people to help you keep the promise(s) you made to your client or customer? In business, it is all about human relations, effective communication and leadership. We know that there are A LOT of opportunities out there for your business." Train staff on "customer service"
>> We believe that when business owners and managers have the right tools and are operating at optimum efficiency, great things happen: employees feel recognized and valued; customers rave about your product or service; sales force truly believes in what they are selling; money and finance concerns become a non-issue; management becomes inspiring leaders; and your business ends up making a major contribution to your community. >> ADDENDA Business Services was created to provide confidential, business consulting, outsourcing and customized business services solutions to entrepreneurs and professionals. We believe that if we can help your company advance to the next level, you, your employees, your clients and your community win. From our three office locations, we are able to serve Buffalo, Rochester, Canandaigua, Syracuse, Watertown, Massena, Malone, Plattsburgh, Glens Falls, Saratoga Springs, NY and all the communities in between and throughout Upstate NY. Distance is no obstacle to us. Whether we work onsite at your location, or use video conferencing or some other form of technology, we are by your side physically or virtually. We are in the problem solving business. >>To discuss your business needs and learn how ADDENDA Business Services can help, call us at 888-851-0414. The call is confidential, there is no obligation and, if we can keep the call under 30 minutes, there is no charge. We are a sophisticated, HR and Workforce Management, Payroll and Business Management firm. Dedicated to helping businesses grow throughout the Upstate New York Regions, we provide services that help companies focus on what they do best. We use a holistic, systems approach to determine the overall health of your organization by assessing, reporting, advising and implementing corrective actions that maximizes your company's fullest potential. Since every client contacts us with different needs, customized solutions are tailored to your individual objectives, whether those needs are sales, operations, marketing, customer service, public relations, administration, human resources, financial, conflict resolution, leadership and/or managerial in nature. We endeavor to provide services as quickly as possible and at an affordable pricing structure. We are very unique in terms of the diversity of services we provide; moreover, we are able to serve any company anywhere in the country thanks to technology. With 2 office locations in Upstate New York, most of our clients are from Buffalo, Rochester, Syracuse, Watertown, Massena, Malone, Plattsburgh, Glens Falls and Saratoga Springs, NY. OUR UNIQUE, EXTENSIVE EXPERIENCE - We Know Upstate New York: We are locals. President of ADDENDA Solutions and ACCORD Mediation Services is Carolyn T. Bryson has over 34 years of banking, finance, mediation, leadership and development, organizational management, sales and operations experience. Her diverse experience serves to benefit you, since she knows what it takes to achieve, to overcome adversity, to remain focused and disciplined when dealing with all aspects of starting and managing a successful organization. It is customary for clients to know their profession inside out and know very little about developing and growing their company, improving the organization's efficiency, addressing personnel issues, and yielding a financially healthy business. Whatever the reason or need for ADDENDA's help, consultation, education, professional development and advisory sessions are natural components of the ADDENDA and CLIENT relationship. As our client, you will see us roll up our sleeves and do what it takes to help you get the job done, completed correctly, and in a manner that keeps your company's operation sustainable long after we are out of the picture. Our first meeting begins with listening to you, making note of your concerns, validating your successes, listening to your thoughts about your needs and building our relationship. From this session, we prepare an assessment, which includes a list of priorities, recommended corrective actions, proposed timelines, identification of needed resources, projection of anticipated expenses and fees. If the client and ADDENDA Business Services mutually agree to work together, then a contract is prepared and signed; we then get to work. ADDENDA Business Services is made up of a team of professionals who are the best in their field and available to work as clients' needs occur. ADDENDA's holistic, organizational systems approach recognizes that every department of your organization is connected and affected. Since it is common that one problem in one department or with one staff person is highly likely to have an effect on another. At ADDENDA, it is about you. Our mission is to help your business grow and excel far beyond your competition. While we work with you to fix certain problems and address specific issues, we are also working on relationship building. This entails modeling effective communication, exhibiting principled leadership skills, engaging your employees and customers with effective listening and problem-solving skills. We are also mentoring you, to help you become a more effective and inspirational leader. This just comes with the package. ADDENDA Business Services a private firm with a fee structure that is intended to accommodate any budget. Because we are a private firm, we are far more hands-on with our business model while working with our clients. 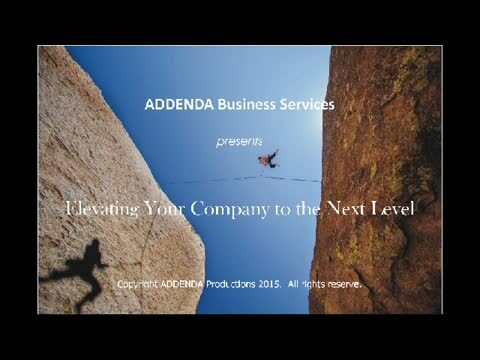 Whether our client is an inexperienced entrepreneur who desires to start a company right away, or an executive director of a non-profit organization who seeks confidential guidance about how to expand a program that will bring in more revenues, or a highly experienced licensed professional who wants to expand his or her practice by bringing in another partner, ADDENDA Business Services is able to be by your side, helping you reach your objective. Since every client usually wants their business to be up and running yesterday, our role is to get right on it as your pseudo business manager, so to speak. Working side-by-side with the client during this crucial stage is essential, since they possess this high level of determination. Maintaining this dynamic at a high-energy level is one of our many tips for their forging ahead, seeing progress as their new endeavor unfolds. We have even been known to perform actual work for our clients in a crises situation due to an employee suddenly fired because of alleged theft, or sudden illness of a key employee with no one else in the office knowing how to perform her duties, or more than expected sales transactions to post into the computer and process due to poor advance planning. A great percentage of our clients are existing, well-established companies that have either reached a plateau or are experiencing a tipping point that is having an adverse affect on certain elements of their organization. We have been frequently told by owners and managers that there are little to no resources that can handle the breadth and depth that ADDENDA Business Services and ADDENDA Solutions can provide existing businesses and non-profits. Regularly planning meetings by phone, video conferencing, or in person with the client serve to fuel their enthusiasm, elevate their level of self-confidence, celebrate their successes along the way, and brainstorm solutions together when obstacles get in their way. Our objective, at the end of the day, is to empower the client to ultimately be prepared to manage all aspects of their enterprise and to be successful in the shortest period of time and viably sustainable for many years to come. Regardless of our physical location, technology enables us to help any company located anywhere in New York State. Copyright © 2017 ADDENDA Corporation. All rights reserved.